Classic Army is a leading manufacturer of Airsoft products, setting standards for the entire industry. This model of the M16-A2 will ship directly from the manufacturing center. Additionally, M16-A2 is priced lower since the product is coming from Hong Kong! This is literally one of the best deals on Earth considering the package can ship to any country where its legal. It's time to get your hands on this affordable deal coming straight out of the factory! You would expect authenticity and innovation from a company like Classic Army, and that's what you get with the Classic Army M16-A2 Rifle AEG Airsoft Gun from Airsoft GI. A leading manufacturer of airsoft products, Classic Army has set the pace and standards for the entire industry for a decade with the first full-metal production M4 and MP5 AEGs, the first glass-filled nylon fiber AEG in their G36 and the first high-end SCAR AEG. 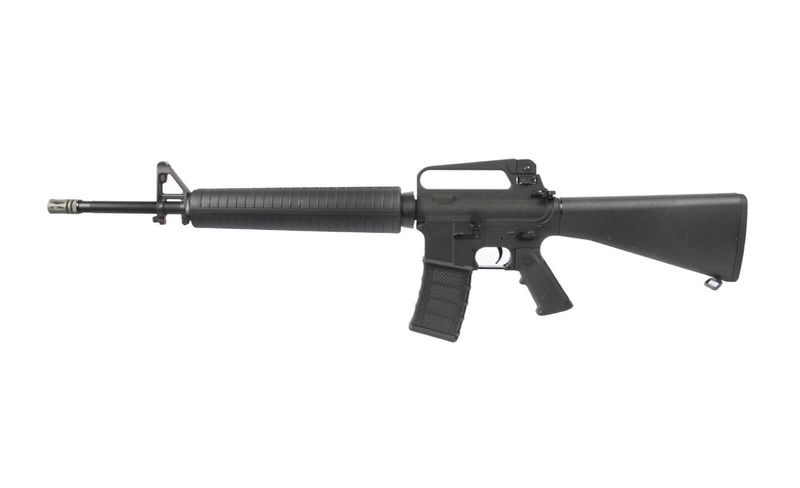 The Classic Army M16-A2 Rifle AEG Airsoft Gun continues that proud tradition. Modeled after the famous M16 that has served the U.S. for so many years, the CA M16-A2 looks and feels like the real thing. The M16 has been on the ground in the hands of American troops all the way back to Vietnam, and the CA M16-A2 is an accurate representation of this famous assault rifle. It features an M16 style metal body that has a fixed carry handle. Boasting lots of rugged, durable metal construction, this gun incorporates improved materials. The handguard, pistol grip, and full stock are now made of nylon fiber for durability, light weight and easy care. OK The Flash hider was broken on arrival, not a big problem got a Silencer the day be for it arrived. Right out of the box it's a laser beam. Played with it all day long no problems. Shoots Pretty far. 100m without trying and little to no hopup and every shot is on point. I recently had a CYMA m16 break due to a plastic lip holding the upper and lower receiver together, and would prefer to get a gun with good build quality to ensure that no such event occurs again. What battery dose it use? Most players prefer using a 7.4v lipo battery.